Horizons can be open or cluttered, vast or close. Skyscape taken Oct. 2 looking west-southwest. Looking north on I-540 south of Fayetteville, Ark. 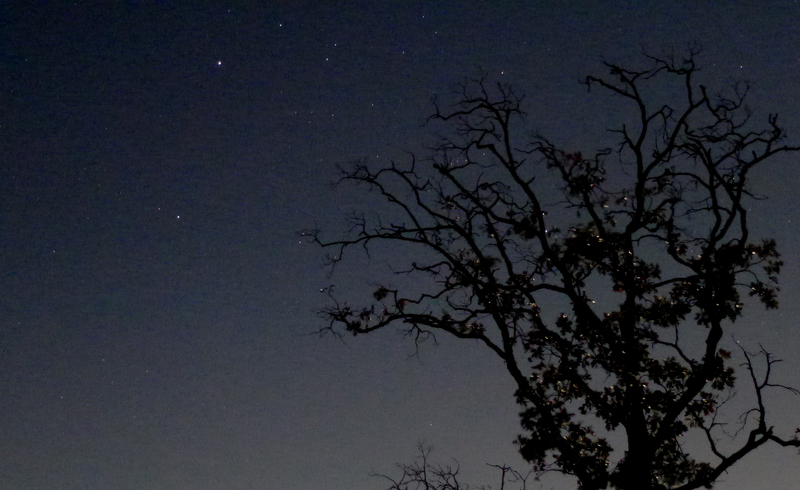 The tree-laden horizon to the northeast. Little garden snails are common here on top of the mountain. 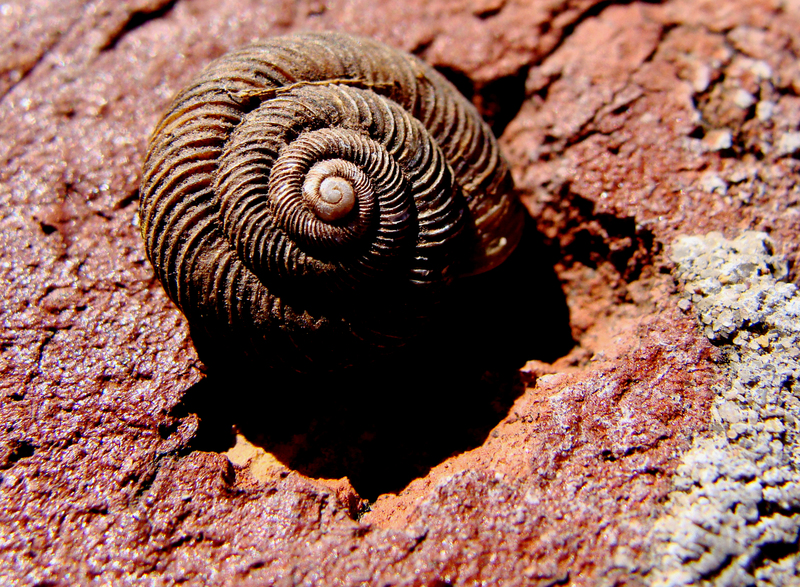 This one was unusual in its size, about .75 inches in diameter, and the ridges along its spiral. Most of the shells we find are much smaller, smooth and transparent. Walked out on the deck to water the plants one morning and saw a grasshopper. 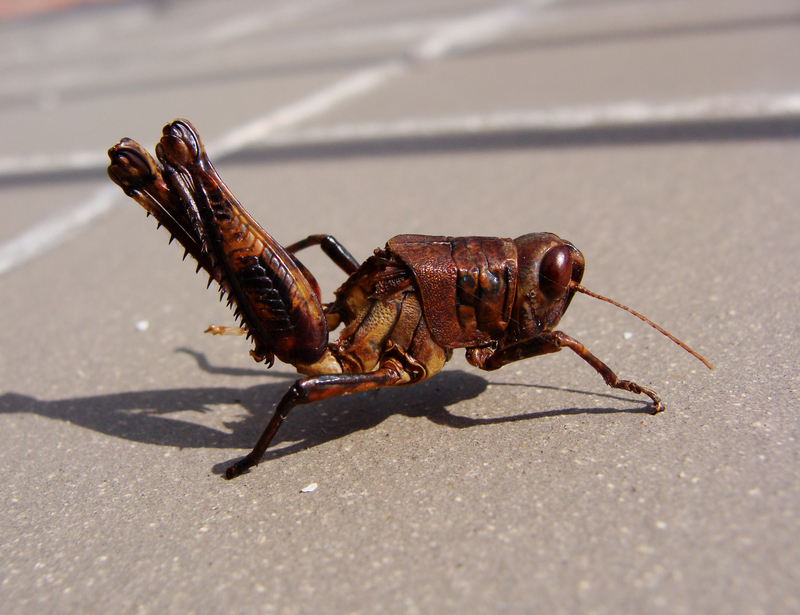 Not an unusual thing, since our yard is a grasshopper haven. However, upon closer inspection, this neat and upright shell was all that remained from someone’s dinner. 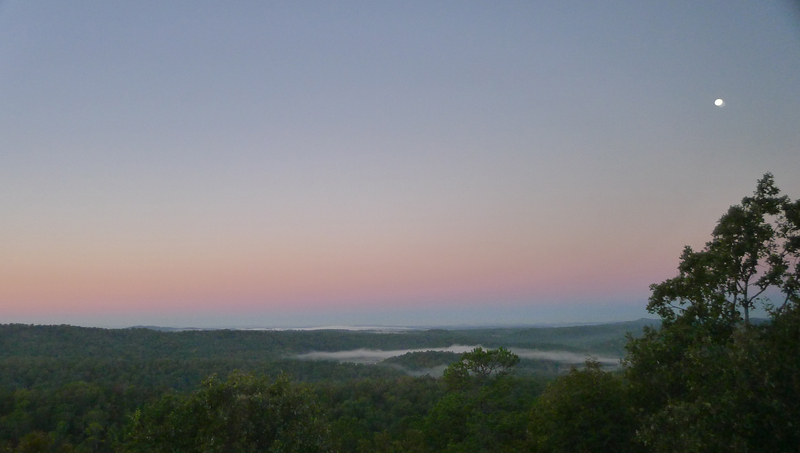 Early morning fog lifts from the Arkansas River near the Terry Lock and Dam. The dam, and the Big Dam Bridge that runs over the dam, are the structures in the distance just visible beneath the shroud. 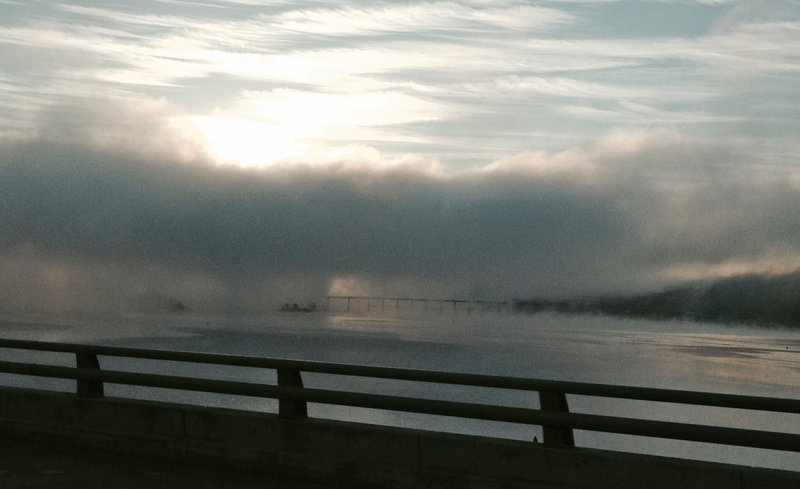 SHROUDED — Arkansas River taken from the I-430 crossing, which is one of the most beautiful in the interstate system. Both sides of the spiny orb weaver are interesting. A shot lit by flash (not shown here), shows the dark side is actually covered in silk. 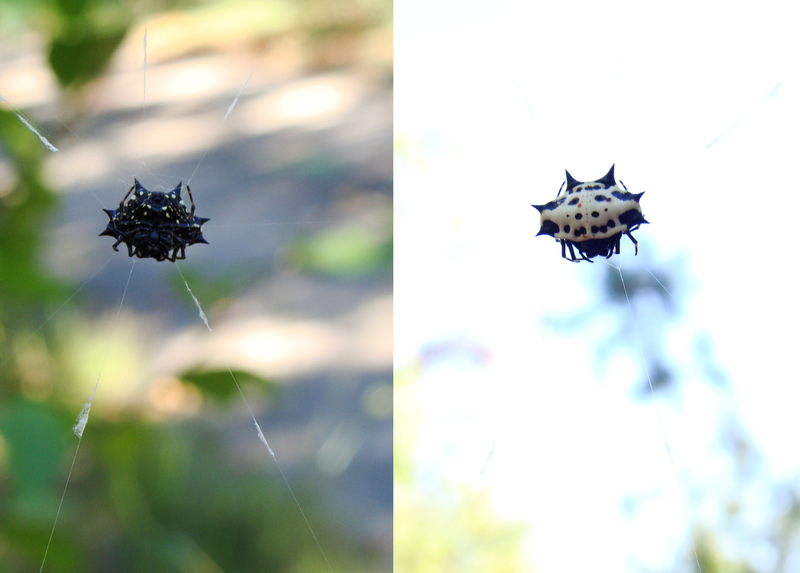 TWO SIDED — Front and back shots of the same spiny orb weaver hanging ’round the Ouachitas. The goldenrod has been a busy place for mason bees and honey bees, not to mention moths, beetles and butterflies. We are watch and wait, ever hopeful the monarchs will stop by on their yearly migration southward. Mason bee nestles deeply into the goldenrod. We keep a patch of giant goldenrod growing at the front of the house to provide a way station for visiting monarch butterflies, but other insects make themselves at home there, including all manner of bees, wasps and wheelbugs. Wheelbugs, named for the cogged half wheel atop their armor, lay in wait in the yellow flowers, stalking their prey. 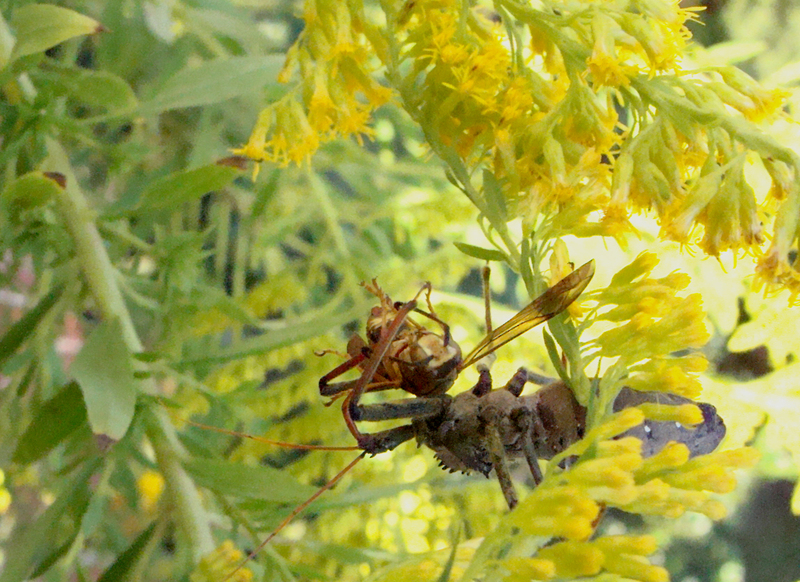 The wheelbug in the top shot had caught a bumble bee and dragged it at least 5-6 feet before I stopped following it. The one in the second photo snagged a wasp. 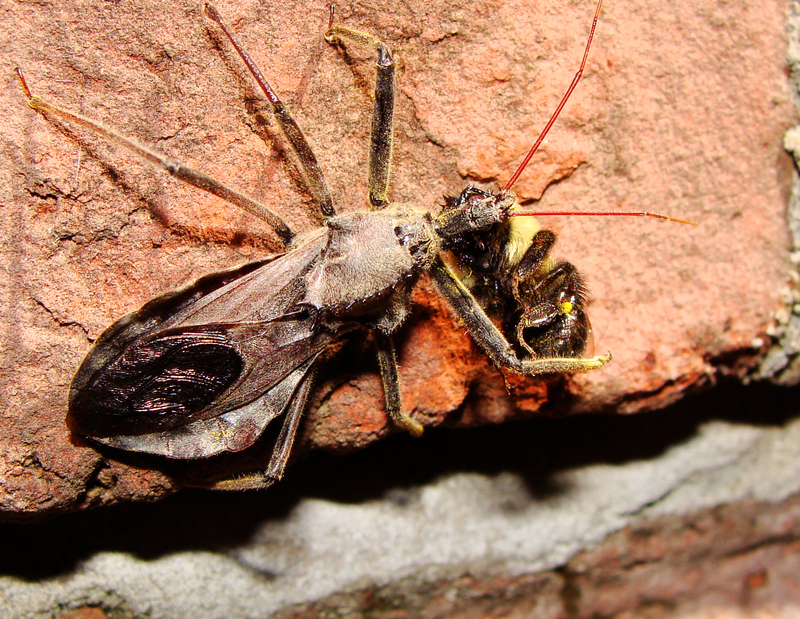 The insects insert their beak into the prey, injecting a fluid that paralyzes and dissolves the victim’s insides, which accounts for why there seemed to be no fight left in either the bee or wasp. Unrelated note — this is our 700th post! 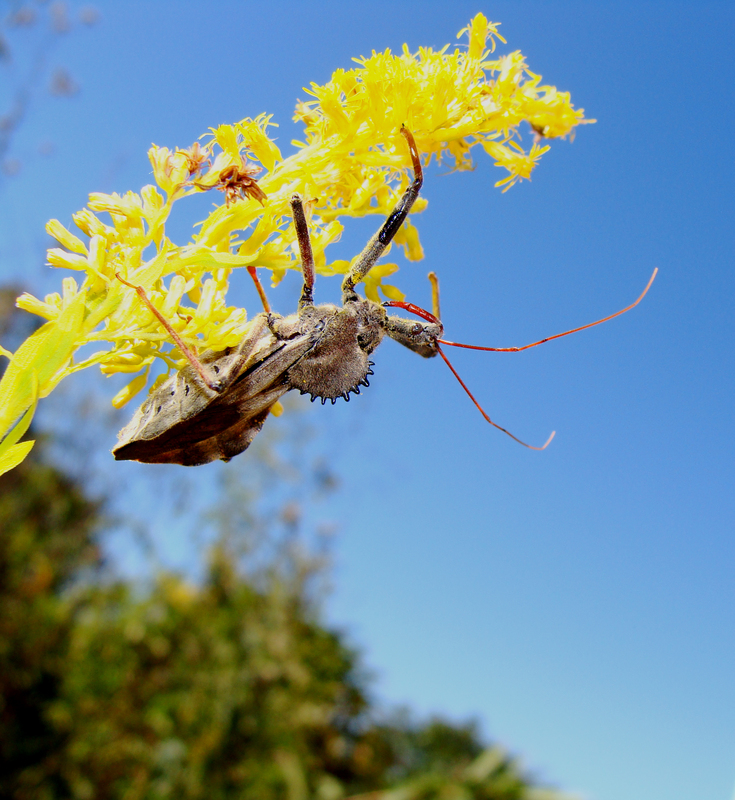 Wheelbug, dusted with yellow pollen from the goldenrods, drags its prey. Inverted wheelbug eating wasp. Its cogged wheel can be seen running along its back. In profile, you can see the wheel.